Edwin J. Peterson Professionalism Award. The deadline for all nominations is Tuesday, June 11, 2019. Nomination criteria, forms and other information can be found below. For additional information please contact Kay Pulju at (503) 431-6402, (800) 452-8260 ext. 402, or kpulju@osbar.org. Front Row, l-r: Edward P. Miska; Frank Porcelli, Jr.; Hon. Jerome E. LaBarre; Robert Harris; Ira L. Gottlieb; Chris Costantino, OSB President; Frank H. Lagesen; Thomas M. Landye; Albert J. Bannon; Henry H. Hewitt; William P. Hutchison, Jr.; Lloyd B. Robinson. Second Row, l-r: Gavin W. Armstrong; Robert J. Altman; Charles W. Carnese; William G. Blair; Edward J. Sullivan; Gary A. Rueter; Warner E. Allen; Jere M. Webb; Allyn E. Brown; Daniel C. Ellis. Third Row, l-r: Donald A. Loomis; David L. Jensen; Kenneth C. Bauman; Robert E. Glasgow; Kenneth E. Roberts; Baron C. Sheldahl; Dean S. Kaufman; Hon. William M. Horner. Back Rows, l-r: Joseph W. Maylie; Charles Robinowitz; John R. Bakkensen; Michael E. Kohlhoff; Richard M. Mollison; Dean C. Werst; Richard E. Alexander; James C. Van Voorhees; Keith E. Tichenor; Hon. Wayne R. Harris. Not pictured: Theodore D. Abram; Hon. 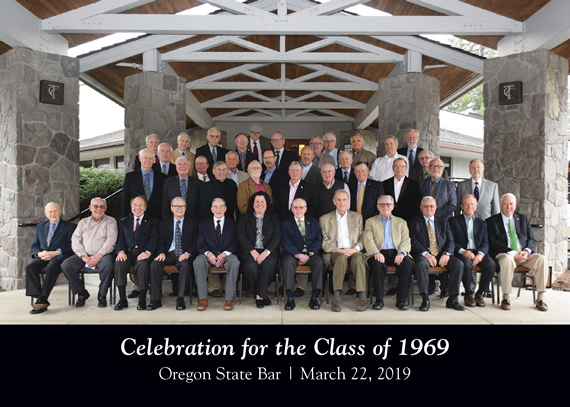 Raymond R. Bagley, Jr.; Howard R. Bartlett; William M. Beers; Bergen Bull; Stephen A. Cohen; W. Brad Coleman; John G. Cox; Douglas J. Dennett; Lawrence R. Derr; Terry G. DeSylvia; Roger F. Dierking; Fred Divita; William Finestone; Ben Graham; Ronald S. Grossmann; H. Robert Hamilton; Larry C. Hammack; Robert L. Haskins; Richard G. Helzer; Dale M. Hermann; Colin D. Lamb; Ronald L. Marek; Hon. Maurice K. Merten; Ronald L. Miller; Stephen H. Miller; Douglas L. Minson; Barry M. Mount; Victor C. Pagel; James O. Smyser; Richard A. Stark; N. Robert Stoll; D. Keith Swanson; Martin B. Vidgoff.